When you have places to go and things to do, the Huffy Nel Lusso is the perfect choice. This bike features a front basket with room for your sweater, phone, keys and more. When you need to carry a bit more, the rear rack is easy to use. Keep your favorite drink at your fingertips using the convenient beverage holder on the handlebar. The Huffy Nel Lusso has classic fenders to keep you dry, plus comfort features you are sure to appreciate like the padded spring saddle and dual-density grips and pedals. The single-speed bike has an easy-to-use coaster brake. 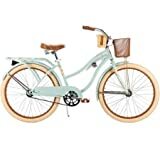 The durable steel frame in Mint is designed for great cruiser riding. The padded spring saddle is designed for a comfortable ride, featuring an alloy quick release for easy adjustments. Double comfort two-tone grips and pedals coordinate the overall look. Huffy bikes are all about fun - go for it.